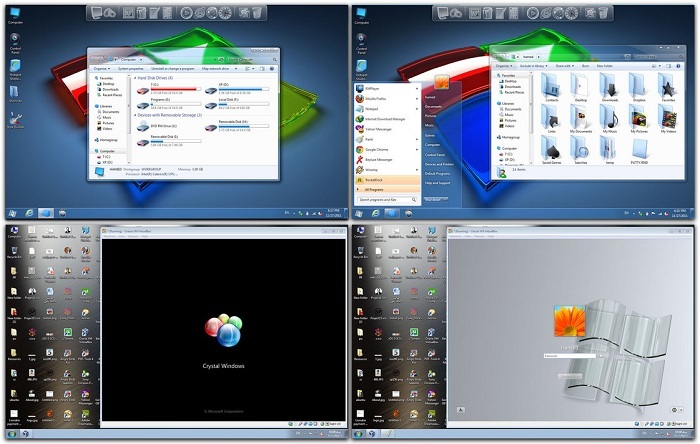 Windows 7 Theme Crystal Skin Pack is created by hameddanger. We published other great works by Kiko11 before. This Visual Style is for Windows 7. Windows 7 Theme Crystal Skin Pack on both 32 and 64-bit. Included system files are for Service Pack 1. Skin Packs installer have easy and safe install option , Please unistall old or other version of skin packs before install new version. Before install disable user account controller and close all running program , after finish restart your system. It is a 30 MB ZIP download, download according to your version (32 bit or 64 bit) of Windows 7. This Article Has Been Shared 1745 Times! Windows 7 Theme Crystal Skin Pack is shiny Visual Style has a clean frosted glass appearance. The themes comes in two versions – dark and light versions. Cite this article as: Abhishek Ghosh, "Windows 7 Theme Crystal Skin Pack," in The Customize Windows, April 6, 2012, April 25, 2019, https://thecustomizewindows.com/2012/04/windows-7-theme-crystal-skin-pack/.